Located in one of Alfaz Del Pi all year round residential urbanisation's, this 3 bedroom, 2 bathroom villa with hot & cold air-conditioning units fitted in each bedroom benefits from it peaceful surroundings and relaxing environment.The large 10m x5m swimming pool can easily cater for 6 people to have fun and enjoy, now with a completely tiled surrounding offering large areas to relax comfortably. Situated just inside the urbanisation it is easy to find and very close to all amenities, shops, bars, restaurants are all walking distance away. With 2 entrances to the property your vehicle can be parked in its grounds suitable for 3 cars. The perfect holiday can be catered for due to the villa's centralised location, for night life you have Benidorm just 10 minutes drive away, for more relaxed and scenic nights out you have Altea, if you enjoy walking you have Albir promenade leading to Altea's fishing port and for those who like a bargain there is a weekly market in each and every adjoining village. Alfaz Del Pi is probably Spain's most international village on the Costa Blanca. Large bathroom complete with toilet, bidet, full size bath/shower, double sink wash basin unit. Hairdryer. Ensuite bathroom with easy walk-in shower enclosure. Provided by fireplace and oil radiators Warm air heating Air-Conditioning in each bedroom. Bed sheets, pillows and pillow cases are provided. Parking with in the grounds of the property or directly infront on the street. All plates, cups, cutlery, glasses, plastic glasses for swimming pool area etc are provided. Flat screen TV with HDMI inputs. Board games and others provided. There are various golf courses in the immediate area: Villaitana Levante golf course, 6,600m in length, Terra Mitica (10mins drive). Villaitana Poniente golf course, 3,800m in length. Practice gound in Albir (5mins drive). Don Cayo, Altea (15mins drive). La Sella, Denia. Bonalba, Mutxamel, Alicante. Although once inside the villa it is all on one level but to enter the villa 4 steps have to be used, also to sit around the swimming pool steps have to be used , so we consider the villa not suitable for wheelchair users. New for 2018, completely tiled around the pool to maximise comfort. Sunbeds for all. Had a fantastic 2 weeks at the villa. everything was wonderful. Ali and his wife were really friendly and helpful and couldn't do enough for us. the pool is really big and the privacy is really good as well. The village is really nice and just a 15minute stroll away. great bus service to Benidorm the number 10 takes 15 mins to the centre of the city and runs every 15 mins. would not hesitate to return to this brilliant accomidation. Fabulous Villa & Pool.Everything you need in one place. Absolutely fantastic villa & pool. The villa is equipped with everything you could think of, very clean & tidy.The pool was lovely,warm and great size. So many different seating areas in the sun or shade. Supermarket & pharmacy 5 mins walk away. Will be returning. Thank you to Ali & Sharon for making our stay perfect, always on hand if you need them. Had a fab family holiday here end of June 2017 ( Air con added then so nice cool bedrooms on hot nights with a sleep function meaning you don't wake up freezing). The villa is roomy and very well equipped with all anyone could need, so I would imagine this is a good year round booking. Outside there is a great sized pool - plenty of room for the 5 of us to be floating about in without incident ! It also has varied outdoor seating areas making it perfect to escape for a quiet read or rest in the shade. The local supermarket is excellent and 5 mins walk away. Hiring a car is sensible though, as there's so much to see in the area and although you could walk to buses, its much easier by car. We had a Nissan Juke for 10 days from Alicante airport for about £100, so very reasonable. The very friendly owners live nearby but left us with total privacy (but were immediately on hand when the fridge broke and replaced it that day !! ). Can definitely recommend. Villa was lovely and the pool is amazing, hoping to return soon , thank you for great holiday . Lovely villa equipped with everything u will need.Plenty of clean towels and bedding.Quiet location yet near enough to walk to local supermarket and pharmacy. Brand new large swimming pool deep enough to dive ,which pleased our teenagers.Alistair and Sharon really helpful ,friendly people. 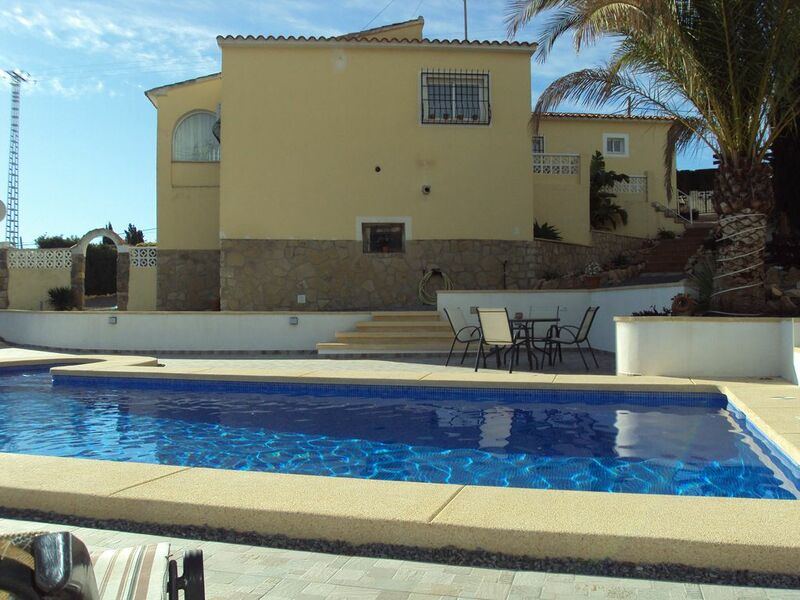 Stayed a month in this spacious and well equipped villa in a quiet residential area of Alfaz. Within easy reach of lots of restaurants and the coastal resorts of Altea and Albir, also close to the popular resort of Benidorm. The property is exactly as described, we particularly enjoyed the log burning fire which made for cosy relaxing evenings in when we were not out enjoying the many restaurants already mentioned. Ailstair and Sharon are very helpful and have extensive knowledge of the area, anything we needed to know we only had to ask, nothing was too much trouble. This place is a real gem as there is so much within easy reach yet if you want a quiet relaxing holiday then there is no need to go anywhere. There is a large well maintained garden where you can sit out in the sun and chill (we even did a little gardening - Alistair didn't mind). Would we recommend this property? - you bet we do, and we will be returning next year. This villa is located between 2 major sporting facilities, Alfaz Del Pi 2mins drive and La Nucia 5 mins drive, complete with running tracks, tennis courts, basketball courts (indoor and outdoor), rock/wall climbing, outdoor swimming pool (Alfaz) indoor heated swimming pool (La Nucia). La Nucia now has a recently completed BMX track. Two go-kart tracks are also 10 min drive away. For those who enjoy walking, Albir has a walking route which takes you to the light house for even more spectacular views and the old historic Ore caves. Albir/Altea's pebble beach is the closest at just 5 mins drive, Benidorm famous for its sandy beaches "Levante & Poniente" is 9kms away, Calpe beach is 25kms. Alicante International airport is located at 67kms (58kms motorway driving) Valencia airport is 150kms (133kms on motorway) San Javier-Murcia airport is 146kms (134kms on motorway) AP7 motorway toll gates 9kms from the villa. Car hire is highly recommended but is not essential as there is a bus stop within walking distance away and a call out taxi service available from the village, although car hire is highly recommended to visit all the beautiful surrounding areas. Alfaz Del Pi walking distance. Albir 5kms. La Nucia 5kms. Altea 8kms. Benidorm 8kms. Callosa d'Ensarria 12kms. Calpe 25kms. Within a 10 km radius you have all of the Costa Blanca's main theme parks, Terra Mitica, Terra Natura, Aqua Natura, Mundo Mar and Aqualandia. Alfaz village has an array of banks, restaurants and shops. Within walking distance at the entrance of the urbanisation there is a Chemist, bar/restaurant, take away and "Mas y Mas" supermarket or a 10 minute drive takes you to "Carrefour" and "La Marina" shopping centre. Alfaz has its own railway station for those who just want to explore and travel up and down the coast. Benidorm famous for its nightlife and fabulous beaches is just a few minutes drive or for a more tranquil evening "Altea's" church square is a place to visit with its selection of different cultural restaurants and spectacular views. Inland takes you to the "Castell de Guadalest" one of Costa Blanca's most famous land marks or you can visit "Fuentes del Algar" a natural waterfall located just 2kms from "Callosa d'Ensarria" both places with restaurants to make a lovely relaxing day out.